You put a lot into your company. And more than a few sleepless nights, fretting on making ends meet. How to choose the right one? The one who will treat you as a valued partner, not as simply another transaction. This decision was supposed to make life easier, right? At Bay View Funding, we get it. Since 1985, we’ve listened to businesses as unique as yours. In fact, that’s what we pride ourselves on. Listening. It’s important. Because a good factoring company should value your business as much as you do. In fact, your vision and success should come first. Understanding is a two-way street. That’s why we believe in listening and educating interested businesses about their finance options. Invoice factoring may expand your company’s horizons. Whether you work with us or not, we believe you deserve to know how the factoring industry works. And what you should expect from a top-notch factoring company during the selection process. Invoice factoring is the process of selling a particular asset, in this case your accounts receivable, to an outside “factoring company” for slightly less than what it’s worth in exchange for cash right away. Traditional invoicing to customers can take a month or more. But when you use a factoring company, you can get cash for your accounts receivable in 10 days or less. Often in as little as 24 hours. 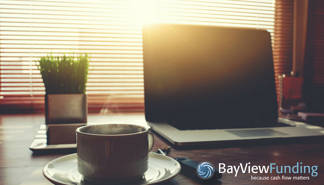 At Bay View Funding, your team – yes, YOUR team – is dedicated to getting you the solutions your company needs. With us, you get a DIRECT line to an account manager. A real human who won’t “pass you around to another department.” You can contact anyone on your team at any time. Provide you with competitive rates. Educate you on the benefits of working with a large factoring company. Take the time to get to know the unique needs of your business. With our team of account executives, you maintain your great business relationships. We are easy to access. And our people are dependable, reliable, and honest. For over 30 years, we’ve helped businesses in every industry – all across the nation – to use invoice factoring as a tool for their success. Bay View Funding delivers the best service in the industry. Feel free to give our veteran team of factoring professionals a call and find out. Contact us here or call (888) 229-9993.